The PHYCOVER project is funded by the French National Research Agency. This project is endorsed by the Mer Bretagne Atlantique and the Mer Méditerranée clusters, and by the Trimatec cluster. The PHYCOVER project (ANR-14-CE04-0011) offers to lay the scientific, technical and industrial basis for further improvement of the wastewater treatment sector, with particular focus on urban wastewaters. The project, initiated in late 2014, aims to study and develop an integrated and modular treatment process for the production of biogas, while identifying opportunities to maximize the valorization of anaerobic digestion’s by-products. In conjunction with previous ANR projects, such as SHAMASH and SYMBIOSE, Life Cycle Analysis of microalgae production systems showed the economic and environmental impact of nitrogen fertilizers used for industrial production of microalgae. On the other hand, mineral resources of phosphorus pentoxide experience significant level of exploitation such as supply of this nutrient – essential to living organisms – could become problematic during this century. Anaerobic digestion provides a way to recycle nitrogen and phosphorus contained in the effluents, and might therefore contribute to improve the quality of our environment and the sustainability of industrial production of microalgae. 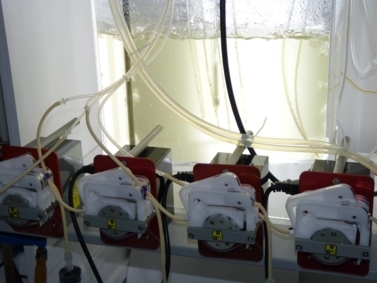 In the context of the PHYCOVER project, the objective of Physiology and Biotechnology of Algae Laboratory (PBA) is to evaluate the potential of anaerobic digestate to produce valuable microalgae based on criteria of productivity and health safety. This research will have deep impact in the Green chemistry area and for the Aquaculture industry. The PBA laboratory aims to study the nutritional capacity of various types of digestates, especially through the study of nitrogen and phosphorus bioavailability and yields for microalgae cultures. A second research aim is to understand the fate of the micropollutants accumulation in the biomass produced, taking into consideration the market requirements.